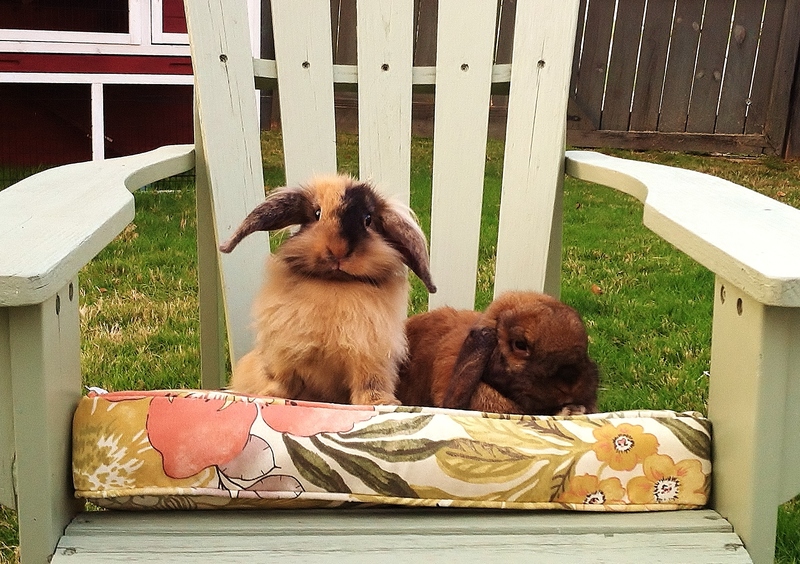 The weather has gotten so lovely and mild, we’ve begun to let the buns in the yard to run around and enjoy the grass. Dave thinks Spring is AWESOME! Buster likes it OK too, but he’s seen it all before. Is it like this all the time Buster? Is that a flower? Do bunnies eat bugs? Why is the sky blue? How long does spring last? Are birds dangerous? Wanna race? How high can you jump? Why won’t you play with me? What’s that smell? If you walked by my back yard recently, you might have thought “Debbie done lost her mind!” She just got rid of one coop, and now she has another one! 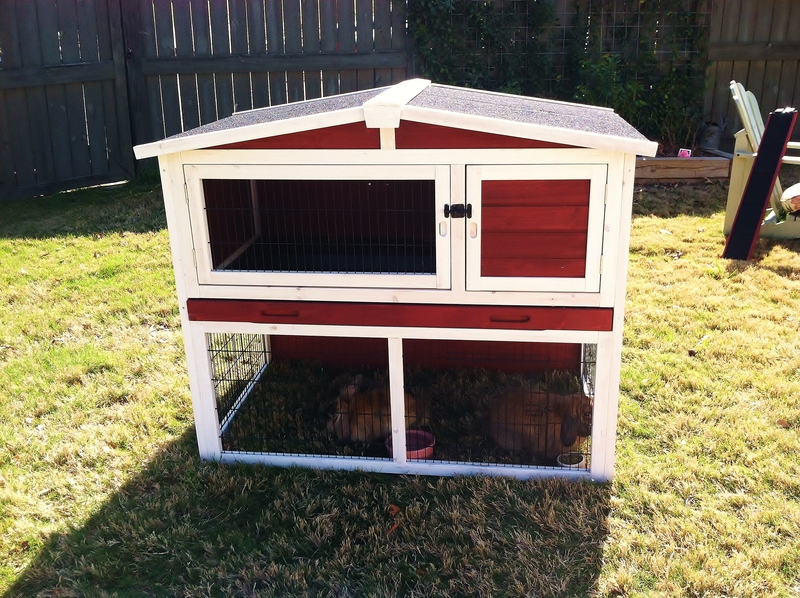 Well, technically it IS a small chicken coop, but I ordered it from the internet and it wasn’t very expensive. Of course, it’s not up to the Jim Burlingame standards of coop construction, but it is quite functional for two wascally wabbits to lounge in during mild weather. 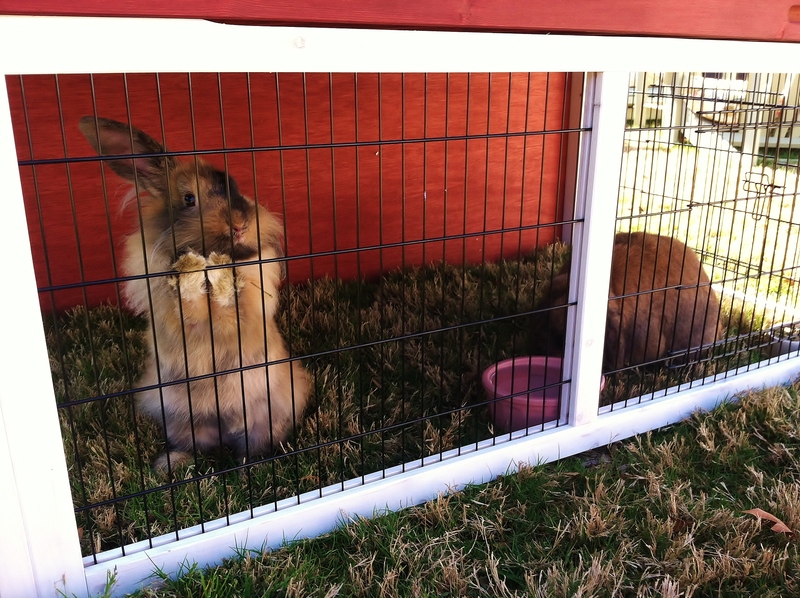 When we’re not around to supervise and the weather is between 50-80 degrees (officially approved pet bunny outdoor temps, by the way) we let them hang outside in their bunny lair. Just like our old chicken coop, it has an open bottom so they can nibble grass, but it has an upstairs too so they can sit on an old rug and chew sticks and watch the world go by. On hot days I put a frozen water block inside so they can lean against it to keep cool. This coop weighs about 1/3 and is about half the size of Rosie, Daisy & Violet’s old house so it’s quite manageable to keep clean and to move about the yard. Stop by anytime to inspect this cute little backyard addition. You’ll find us having “Bunny Time” most nights and if you’re lucky we’ll offer you an adult beverage to go with the entertainment. Happy Spring! Pssssssst, you gotta key for this thing?